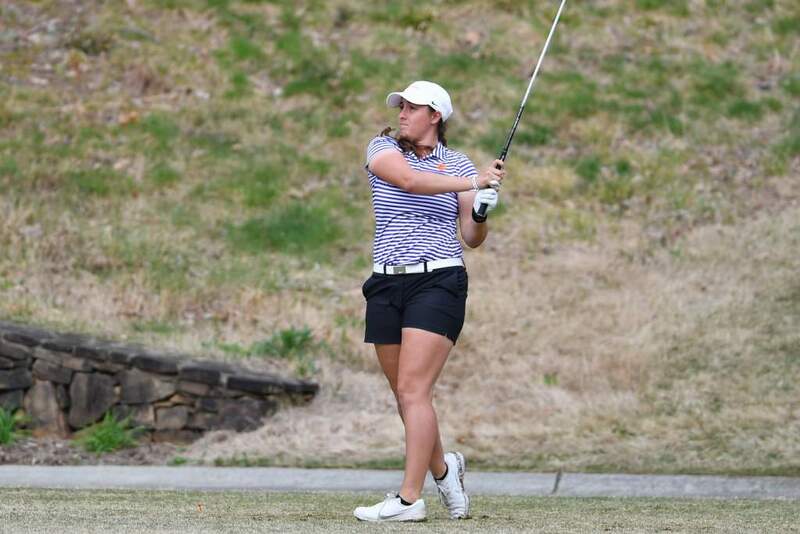 Clemson, S.C.—Lauren Salazar shot a final round 72, and McKenzie Talbert and Marisa Messana added rounds of 74 to lead Clemson to a tie for eighth place in the final standings of the ACC Women’s Golf Tournament at Sedgefield Country Club in Greensboro, N.C. on Saturday. The 11 teams played 27 holes on Friday and 27 on Saturday as tournament officials successfully avoided heavy thunderstorms on Sunday and completed the 27th annual event in just two days. Virginia won the tournament with a score of 27 under par 837, 26 shots better than defending champion Duke. Clemson finished in a tie for eighth with N.C.State a 23-over-par score of 891. One of the teams Clemson defeated was 26th ranked Miami (FL) who finished at 29 over par. J.T. Horton’s team was much improved over last year’s performance at the ACC Tournament. 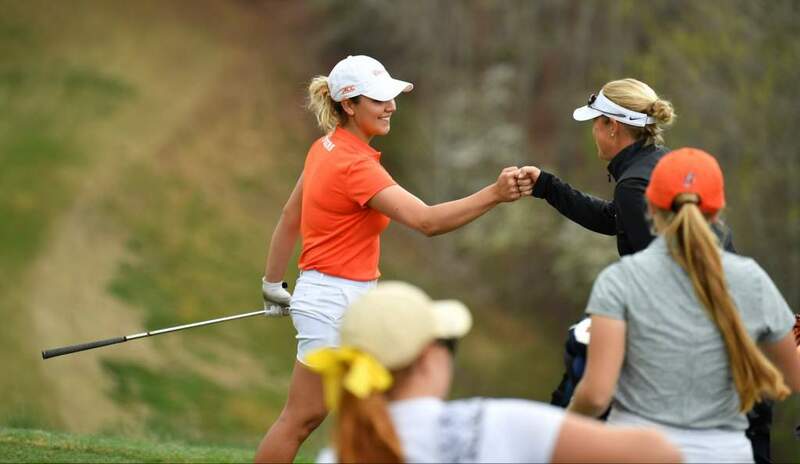 At the 2014 event at the same course, Clemson shot a team score of 921 and finished in ninth place. This year’s team was 30 shots better and a team place higher. All four of the ladies who played in both tournaments had better scores by a combined 36 shots this year. Messana was Clemson’s top player for the three rounds with a three-over-par score of 219. She finished 21st individually, the best finish by a Tiger golfer this year and the second best finish by a Tiger at the ACC Tournament. Last year All-American Ashlan Ramsey finished 15th. Messana’s 219 total was the best by a Clemson player in the two years the Tigers have competed in the event. Messana had rounds of 74-71-74 for her 219 total. The one-under-par 71 in the second round was her second best score of the year and her second under-par round. She finished with 41 pars for her 54 holes, second best in the field of 55 golfers that competed on the par 72 Sedgefield Country Club course that is also the site of a PGA Tour event each August. Salazar had her second round at par in the tournament with her 72 in the final round. She also had a 72 in the first round and became the only Lady Tiger with a pair of rounds at par or better in the same tournament this year. She and Sloan Shanahan both had six birdies in the tournament, tied for the best on the team. The native of California played the par three holes in two-under-par second best in the field. 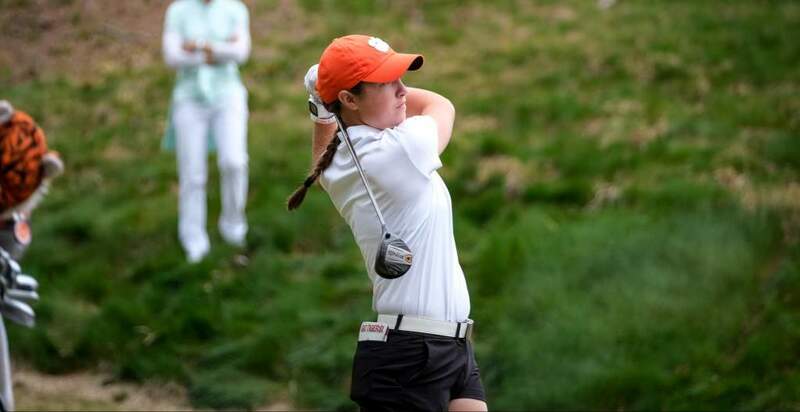 Shanahan was Clemson’s third best golfer at the ACC Tournament with a 224 score. Her best round was the first when she shot a 72. She finished 34th individually. Her 229 score was five shots better than her score at the ACC Tournament last year. 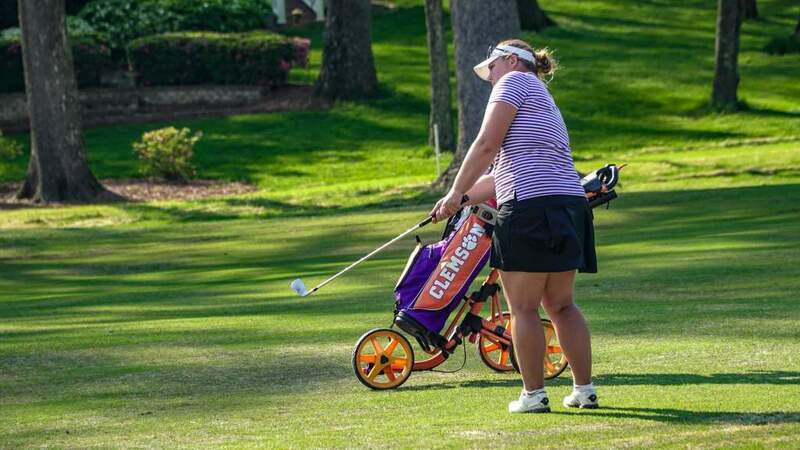 Playing in just her second tournament of the spring, her score counted towards Clemson’s team score all three rounds. Jessica Hoang shot a 229 for her 54 holes and finished in a tie for 45th place. She shot 12 shots better than she did last year at the ACC Tournament and finished the year with a stroke average two shots per round better than her freshman year. McKenzie Talbert shot a 232 for her three rounds, but her 149 shots over the last two rounds were second behind Messana’s 145 shots. Talbert had an 83 in the first round, but had rounds of 75 and 74 to finish. She was tied for Clemson’s second best golfer in each of the last two rounds. Sedgefield Country Club, Greensboro, N.C.
21. Marisa Messana 219, 29. Lauren Salazar 222, 34. Sloan Shanahan 224, 45. Jessica Hoang 229, 47. McKenzie Talbert 232.